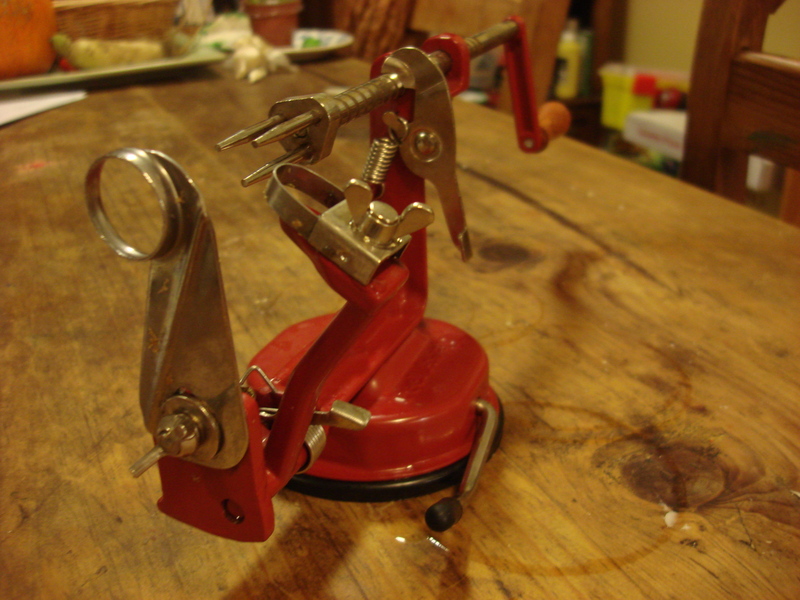 Peel Away Peeler, Corer, and Slicer, courtesy Hatti Langsford. 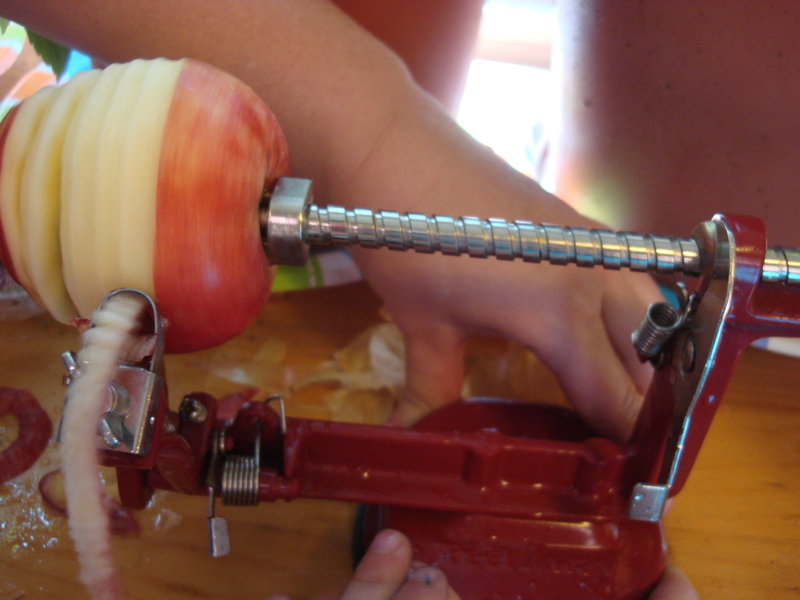 It is indeed an apple corer, which can be set to peel and slice as well. Want one? Click here to shop around…. My dear friend from college (The New School, if you’d like to know), Hatti Langsford, whose recent “sustainable” wedding to Chris Moratz, was covered in these pages, gave it to Leandro when we were visiting them in the New Paltz area last fall. It has since traveled, not just home to us, but to Leandro’s school during Apple Week last year! The kids (and teachers) loved it! And it is a terrific way to get kids eating fruit and involved in the kitchen! It is a marvelous contraption, that Hatti wants me to remind you can also be used for peeling potatoes, and it can be used for pears as well. 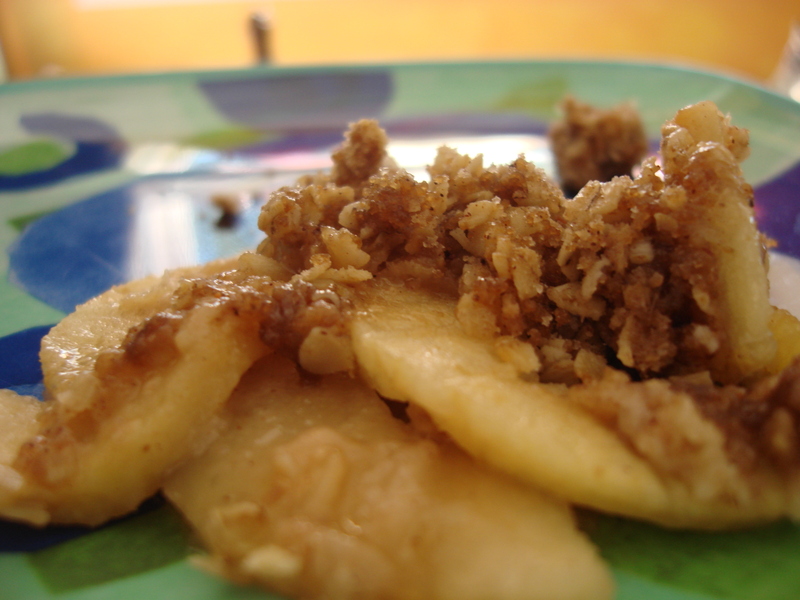 It came in particularly handy for this simple apple crisp recipe, as the spiral slice was the perfect thickness for the dish (1/4 inch); all I had to do was slice each apple once in half from top to bottom after Ashley and Leandro had peeled, cored and spiral sliced them. Make sure the butter is well-distributed through the dry ingredients or you’ll have dry patches. I eliminated the dry patches by covering with foil; the heat finished the topping! I made it in two 8×8 baking dishes so that I had one to take to this month’s Single Mother’s By Choice meet-up (where it met with general approval and most people took seconds), and one to keep! You could also do one large baking dish. Heat oven to 375°F. Grease bottom and sides of two 8×8 or one 8×13 rimmed baking dish with shortening. Spread apple slices in pan(s). In a large bowl, stir remaining ingredients except cream, wetting thoroughly with the butter. Spread over the apples. Bake 30 minutes (add five minutes for glass baking dish), or until top is golden and apples are fork-tender. Serve warm with cream. ← Do You Know What This Is? 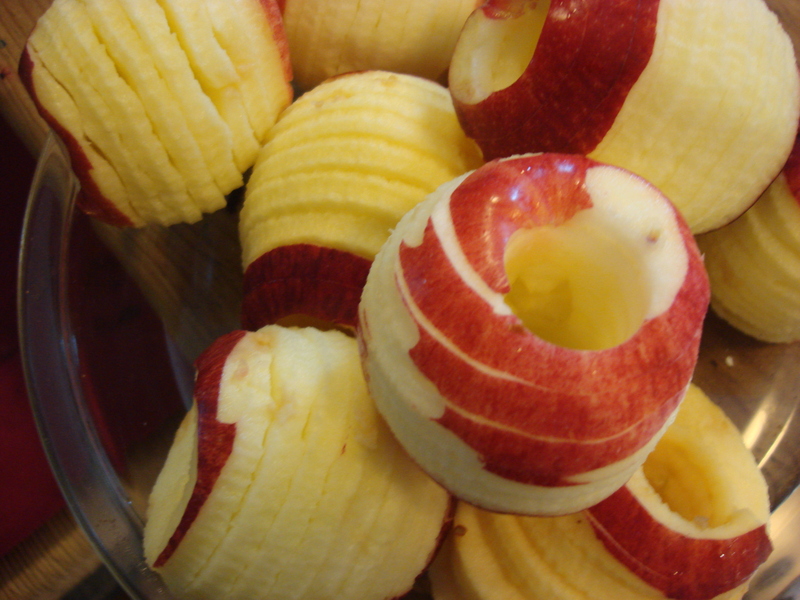 I LOVE the photo of the apples post-coring – what a great trick for a party! For the record, I had NO idea what that contraption was! I have one:D and love it!! Mine is bright green and is one of the gadget purchases I’ll never regret.. my hands used to ache from peeling so many apples and then I’d lose so much of the apple because I would rush. This is just the best, isn’t it? 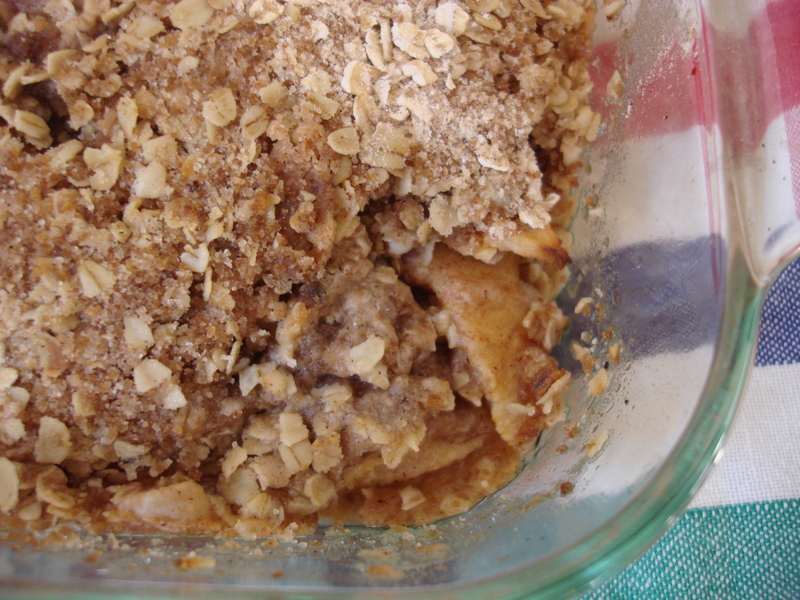 Love Betty Crocker as well, apple crisp is the perfect fall dessert! I love it too! And the kid involvement benefit is a definite bonus…. Delicious recipe and clever gadget. They are very cool gadgets – I love watching them at work. Thank you! With a dollop of ice cream it is just crazy good!